I have an extreme fascination with the periodic table. I have four periodic table neck ties, a periodic table bow tie, multiple periodic table t-shirts and, my pride and joy, my periodic table hi tops. I like to call those my "Air Chads". We have two new display areas in our science wing. Mike Geyer, one of my friends and a great chemistry teacher, took charge of these. He loves the periodic table as much as I do. 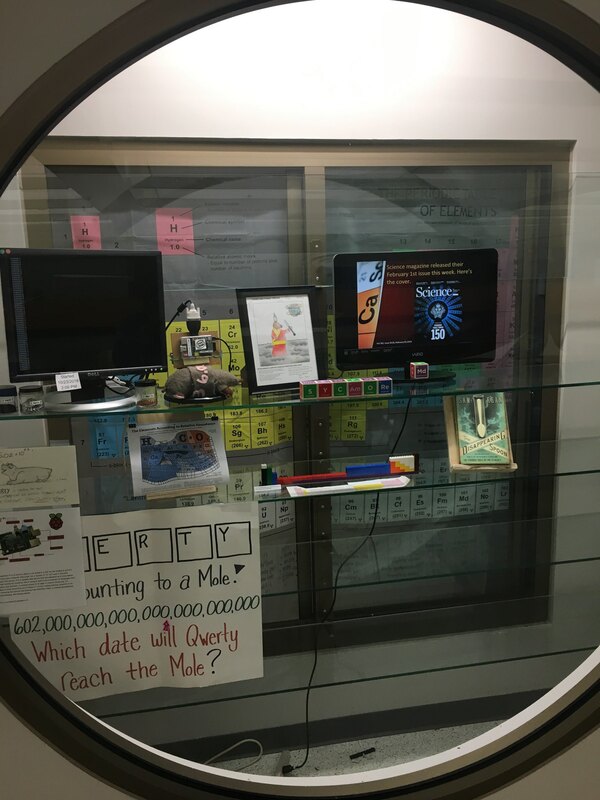 To celebrate the 150 year anniversary of the periodic table he is displaying new tid bits of information each week. First, he worked with the tech department to display a powerpoint about the periodic table that runs 24/7. Along with this is a live twitter feed all about the periodic table. Bottom line....it is the history of chemistry. Here is a real shocker. Kids are taking notice. I have actually seen students in the hallway staring at a screen that is not their phone streaming Netflix! It is kind of shocking. It is also a really pleasant change in the culture. Maybe you do not have the time that Mike does. However, wouldn't it be cool to have groups of students do something like this for a project or extra credit? We started talking as a department about what we can do when Mike runs out of ideas (if that ever happens). Doug Ragan just wrote about periodic tables as well. Check out his post, National Periodic Table Day is February 7th, for more ideas. As a tie in with the periodic table, my daughter had to have a medical test with a couple of radioactive isotopes, gallium and technecium. These isotopes were placed in eggs and juice that she was given. She digested these and then they took a "picture" of the isotopes as they travelled through her to see how her stomach was working. The good news is she got a clean bill of health. I asked the technicians at Children's Hospital in Cincinnati if I could record this. I explained that students have many misconceptions about radioactivity. One misconception is that if they get close to anything radioactive that it could be dangerous. Hospitals depend on radioactive isotopes to do safe tests similar to the one my daughter had. The technicians were thrilled that I was using this for educational purposes. Check out the video below. If you have any cool idea about celebrating the periodic table, please share!